SUMMARY: CT perfusion (CTP) is a functional imaging technique that provides important information about capillary-level hemodynamics of the brain parenchyma and is a natural complement to the strengths of unenhanced CT and CT angiography in the evaluation of acute stroke, vasospasm, and other neurovascular disorders. CTP is critical in determining the extent of irreversibly infarcted brain tissue (infarct “core”) and the severely ischemic but potentially salvageable tissue (“penumbra”). This is achieved by generating parametric maps of cerebral blood flow, cerebral blood volume, and mean transit time. Part 1 of this review established the clinical context of CT perfusion (CTP).1 Next, a discussion followed on CTP map construction using the maximum slope method and the 2 main deconvolution techniques, Fourier transformation and singular value decomposition (SVD) (the latter being the most commonly used numeric method in CTP). Part 2 discusses the “pearls and pitfalls” of CTP map 1) acquisition, 2) postprocessing, and 3) image interpretation. Issues including radiation dose-reduction strategies, methods of correcting arterial input function (AIF) delay, the effect of the laterality of AIF choice, vascular pixel elimination, the importance of correct cerebral blood flow (CBF) and cerebral blood volume (CBV) threshold selection, and the selection of appropriate perfusion parameters for correct estimation of penumbra are addressed. The review highlights the need for validation and standardization of important CTP parameters to improve patient outcomes and design future randomized clinical trials that will provide evidence for the importance of the core/penumbra “mismatch” in patient triage for recanalization therapies beyond the current 3-hour therapeutic window for intravenous thrombolysis. At a recent meeting of stroke radiologists, neurologists, emergency physicians, National Institutes of Health (NIH) administrators, and industry leaders in Washington, DC, sponsored by the NIH and the American Society of Neuroradiology, both technical and clinical issues regarding advanced acute stroke imaging were discussed. Expert consensus regarding standardized CTP and MR perfusion (MRP) acquisition was achieved, published simultaneously as a position paper in American Journal of Neuroradiology and Stroke.2,3 The baseline CT study should have 3 components: unenhanced CT, vertex-to-arch CT angiography (CTA), and dynamic first-pass CTP.4 Addition of cardiac multidetector row CT (MDCT) for the detection of possible left atrial appendage thrombus is optional but may gain in popularity because cardioembolic strokes comprise about one third of all ischemic strokes (and their incidence appears to be increasing as stent placement/endarterectomy for primary stroke prevention of carotid embolic stroke becomes more common place).5 Ruling out a cardiac source may have important consequences for patient management. A recent study reported 80% specificity, 73% sensitivity, and 92% negative predictive value for cardiac MDCT compared with more invasive transesophageal echocardiography.6 Another recent study reported a positive predictive value of 99% and a negative predictive value of 96%,7 making cardiac MDCT an appealing component for an integrated neurovascular protocol. Sample CTP scanning parameters based on the general consensus of the meeting and our institutional protocols by using a 64-section volume MDCT (LightSpeed; GE Healthcare, Waukesha, Wis) are shown in Tables 1 and 2. For CTP, A contrast bolus of 35–45 mL is administered via power injector at a rate of 7 mL/s, with a saline “chaser” of 20–40 mL at the same injection rate. The contrast used should typically be a high concentration, ideally 350–370 g/dL of iodine, to create the greatest peak enhancement and hence the optimal signal-intensity-to-noise ratio for CTP map calculation. Imaging in cine mode (CT table stationary) begins a few seconds after injection. In the past, protocols were designed to acquire 1 image per second for 45 seconds,2,8,9 principally to minimize radiation dose. However, this relatively short imaging time risks obtaining an incomplete concentration of tissue, Ctissue(t), curve in patients with poor cardiac output, atrial fibrillation, and proximal internal carotid artery occlusion or hairline lumen. Additionally, measurements of blood-brain barrier (BBB) permeability may be possible from time-attenuation curves (TDC), but this also requires longer acquisition times. To date, there is limited experience with quantification of the permeability of the BBB in acute stroke; most studies have assessed the vascular permeability of tumors.11 The severity of BBB disruption has, however, been shown to correlate with outcome in ischemic stroke, and more routine incorporation of permeability measurements in the near future is possible.11 Similarly, a recent study suggested the potential of permeability MR imaging to identify patients with acute ischemic stroke at higher risk for hemorrhagic transformation.12 Existing deconvolution techniques can be extended to enable quantification of BBB permeability.13,14 Overall, the approach outlined above allows good temporal resolution at the start of scanning, when sampling the TDC frequently is more important for good curve fitting but does not truncate a TDC that has some delay in washout due to delayed contrast delivery. At the same time, less frequent sampling ensures that overall radiation exposure is not significantly increased. Z-Direction Coverage and Section Thickness. The volume of brain tissue included in a first-pass cine CTP study is constrained in the craniocaudal direction by the width of the CT detector. Hence, the z-axis coverage of each acquisition depends on the manufacturer and generation of the CT scanner. This limitation arises from the routine rapid early acquisition rate of 1 image per second, which does not allow sufficient time for tabletop movement. The detector configuration can be varied so that a number of different section thicknesses can be obtained simultaneously. For example, with a 16-detector row scanner, a 2-cm slab is obtained, consisting of either two 10-mm or four 5-mm-thick sections.8,9,16 With a 64-detector row scanner, a 4-cm slab can be acquired with each injection. The maximum degree of vertical coverage could potentially be doubled for each bolus by using a “shuttle-mode” technique, in which the scanner table moves back and forth, switching between 2 different cine views, albeit at a reduced temporal resolution of data acquisition.17 Alternatively, 2 boluses can be used to acquire 2 slabs of CTP data at different levels, doubling the overall coverage,18 but—unlike shuttle mode—requiring twice the contrast and twice the radiation dose. Coverage volume will continue to increase with enlarging detector arrays and improved technology. Cutting edge scanners with 320 detector rows offer the possibility of 16-cm coverage without the decreased temporal resolution required with the shuttle-mode technique. However, the optimum temporal resolution for accurate measurement of CBF, CBV, and mean transit time (MTT) is not yet resolved. Wintermark et al (2004)19 studied the effect of changing the sampling interval to 0.5, 1, 2, 3, 4, 5, and 6 seconds, respectively, on the derived CBF, CBV, and MTT parameters, by progressively skipping more images from the original image sequence at 0.5-second intervals. If 10% deviations from the reference CBF, CBV, and MTT values derived at a 1-second image interval are allowed, the image interval could be increased to 2–3 seconds for both normal and ischemic tissue without substantial variance in quantification. Thus, the axial shuttle technique with a sampling interval of ∼3 seconds may be a relatively straightforward and inexpensive method to increase z-direction coverage from 4 to 8 cm for 64-section scanners. Neuroradiologists are familiar with factors that affect patient dose such as pitch, milliampere, kilovoltage peak (kV[p]), and collimation, but there are additional ways to further reduce radiation exposure. The combination of low kilovolt peak (80 kV[p]) with low milliampere-second (typically 200 mAs) has already been noted and is an accepted strategy for dose reduction.9,20,21 (Tube current is directly proportional to dose but at a cost of increased noise, which is increased by 1/√mA). Another method of dose reduction is by decreasing the image frequency of acquisition from the CTP first-pass data. As discussed above, Wintermark et al (2004)19 calculated maps for temporal sampling intervals of 0.5, 1, 2, 3, 4, 5, and 6 seconds in patients with ischemic stroke. Sampling intervals up to 3 seconds in protocols using a 40-mL bolus did not demonstrate a significant over- or underestimation estimation of CBF, CBV, or MTT. CBF and CBV were overestimated and MTT was underestimated only when sampling intervals were beyond 4 seconds. These results suggest that radiation dose can be reduced by up to two thirds during the first phase without altering the quantitative accuracy of CTP (such as is achieved in shuttle-mode acquisition). The effective radiation dose varied between 0.852 and 1.867 mSv, depending on the protocol. The cine mode with two 40-mL boluses and the shuttle-mode technique with one 60-mL bolus had the lowest doses. To put the above dose ranges into perspective, an axially acquired head CT on a standard 64-section volume CT scanner typically has a 3.2-mSv effective radiation dose. For comparison, the background radiation for a person living in Boston for a year is approximately 3 mSv or about that of 1 standard head CT. The radiation from a 4-cm coverage, 1 image/second, single-bolus standard CTP performed at our institution without shuttle mode is approximately 3.7 mSv or slightly more than that of 1 standard head CT. Shuttle mode gives twice the coverage at substantially lower total dose, because we are imaging about once every 3 seconds for 75–90 seconds. Following CTP data acquisition, source images are generally transferred to a freestanding workstation for processing into parametric maps. There are multiple manufacturers of software packages capable of such processing. Although some of these software packages process maps on the basis of the maximum slope method, increasingly deconvolution-based software is being used for the reasons outlined earlier. Postprocessing can be manual, semiautomated, or fully automated. Inputs required for CTP map calculation include the AIF and the venous output function (VOF). Some software packages also incorporate image-processing algorithms that automatically identify a range of tissue and vascular structures, a process known as “image segmentation.” Noncerebral tissue, such as sulci, arteries, and veins, is readily removed from CTP maps by image segmentation, by using thresholds based on attenuation measurements. Gray matter typically measures 30–40 HU and white matter, 20–30 HU; removal of pixels <0 HU or >60–80 HU effectively eliminates bone, fat, and air from unenhanced CT images.22 Alternatively, thresholds can be based on the actual parametric map values. Peripheral blood vessels and perforating arteries should be excluded from CTP maps because they may mimic areas of falsely high perfusion within brain tissue.22 Kudo et al (2003)24 evaluated the efficacy of vascular pixel elimination in CTP imaging in comparison with positron-emission tomography (PET). Any pixel with a higher CBV value than a threshold of 8 mL/min was marked and eliminated from the CBF calculation. The correlation of CT-CBF and PET-CBF measurements was significantly improved when pixels with CBV values above that threshold were eliminated. Vascular pixel elimination appears to be especially useful when the quantitative CBF values of cortical gray matter are of concern. This method eliminates the leptomeningeal vessels that are otherwise almost always present in the subarachnoid space sulci and hence prevents overestimation of CBF. Methods of Correcting for Delay and Dispersion of the AIF. The maximum slope method. 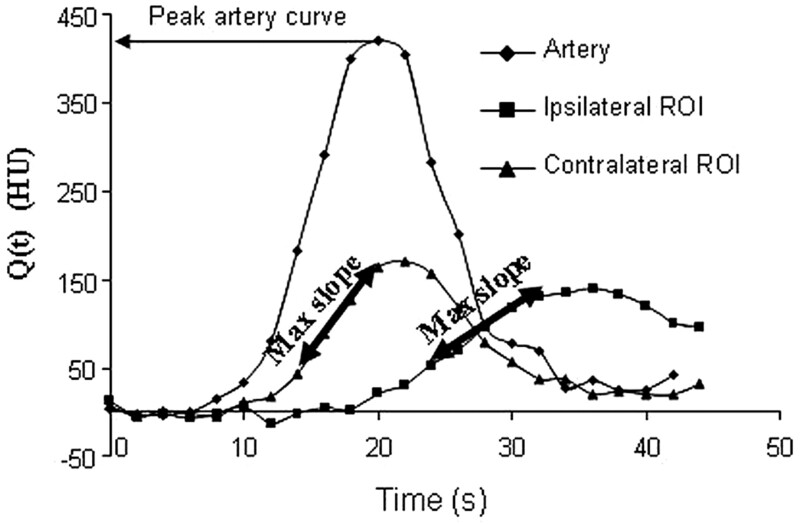 CBF can be calculated from the ratio of the maximum slope (Max Slope) of Q(t) to the maximum arterial concentration. The higher maximum slope in the contralateral region of interest (ROI) (ie, the region of interest without stroke) will give a higher CBF than that for the ipsilateral region of interest, for which the CBF will be reduced. Several approaches have been used to minimize the effects of delay and dispersion in SVD methods. Of note, although Fourier techniques are insensitive to delay, they are very sensitive to noise and thus unsuitable for CBF calculations. Wu et al (2003)27 reported a tracer-arrival timing-insensitive technique using SVD with a block circulant decomposition matrix. The investigators removed the causality assumption built into SVD (ie, that the tissue-of-interest signal intensity cannot arrive before the AIF). This is certainly possible if the AIF is measured from a diseased vessel. Therefore, the calculated R(t)would be shifted by a time delay, but if causality is assumed, R(t) cannot properly be estimated by the deconvolving equation 13. By using circular instead of linear deconvolution (standard SVD), however, the calculated R(t) can now be represented, with R(t) circularly shifted by the time delay. In other words, circular deconvolution avoids the time aliasing of linear deconvolution. Block circulant deconvolution was demonstrated to be insensitive to tracer arrival-time differences with both numeric simulations and clinically acquired data.28 Most important, circular deconvolution performed comparably with standard SVD when there were no tracer arrival-time differences. A recent study in patients with large territorial infarcts confirmed that circular deconvolution outperformed linear deconvolution.28 Moreover, imaging acquisition intervals of >2 seconds were used, lowering radiation exposure without decreasing the signal-intensity-to-noise ratio.28 Members of the Acute Stroke Imaging Standardization (ASIST) group in Japan are currently working with analysis software vendors to implement block circulant deconvolution into their commercial systems (http://plaza.umin.ac.jp). Another approach to delay correction is to use a local AIF estimated from a smaller vessel closer to the tissue of interest. Initial attempts to measure a local AIF were problematic due to partial volume effects.29,30 More recently, automated local AIF selection algorithms for MRP have yielded promising results,31,32 though experience with CTP is lacking. Alternatively, independent component analysis can be used as a tool to define the local AIF. Independent component analysis can be used to identify spatially independent patterns and is based on the assumption that signals of interest can be decomposed into a linear combination of statistically independent components.33 Calamante et al (2004)33 have provided a comprehensive description of this methodology and have compared it with the conventional approach of global AIF in MRP imaging data from patients with various cerebrovascular abnormalities. The independent component analysis approach produced higher CBF and shorter MTT values, compared with the global AIF method, in areas of distorted AIFs, suggesting that the effects of delay and dispersion are minimized. Moreover, independent component analysis demonstrated improved signal-to-noise ratio due to its “denoising” capabilities. Yet another approach is to determine the relative time difference between the AIF(t) and Ctissue(t) TDCs by curve-fitting. Ibaraki et al (2005)34 used a pixel-by-pixel least squares fitting as an initial preparatory step before SVD deconvolution. Only the data preceding the AIF(t) peak were fitted to determine delay, because the “tail” portion of the data reflects the tissue passage of contrast, rather than the tracer-arrival timing. Still another approach is to incorporate the estimation of delay directly into the deconvolution algorithm. Both these latter approaches are simpler to implement than circular deconvolution and independent component analysis. These delay-correction techniques have successfully corrected the underestimation of CBF inherent with SVD deconvolution. Incorporation and standardization of robust AIF delay correction into commercially available CTP software are needed to ensure the reproducibility and reliability of CTP map calculation (Fig 2). To date, only a very small number of vendors have introduced such postprocessing software, though as previously noted, this is a rapidly changing field with frequent new releases by manufacturers (see ASIST-Japan Website: http://plaza.umin.ac.jp). A−H, CTP maps calculated by using a delay-sensitive deconvolution algorithm that is affected by the delay (To) between arterial input and tissue curves. To simulate a range of To, we processed the dynamic images of a single section from a CTP study on a patient with brain tumor such that time-versus-enhancement curves from the entire left hemisphere were shifted forward in time by 2 seconds relative to the right hemisphere. The original and time-shifted CTP studies were then processed by Perfusion 3 (GE Healthcare) by using the same arterial input curve and venous curve from the right hemisphere. A and B, CBF maps for the original and the To = 2 second study. C and D, The corresponding CBV maps. E and F, The corresponding MTT maps. G and H, The corresponding To maps. As To increases, CBF decreases and MTT increases while CBV remains unchanged. The deconvolution algorithm is not able to estimate To. I−P, CTP maps calculated by using a delay-insensitive deconvolution algorithm that is unaffected by the To between arterial input and tissue curves. The original and time-shifted CTP studies of I−P are processed in the same way as A−H except that a delay-insensitive deconvolution algorithm (Perfusion 4, GE Healthcare) is used instead. I and J, The CBF maps for the original and To = 2 second study. K and L, The corresponding CBV maps. M and N, The corresponding MTT maps. O and P, The corresponding To maps. As To increases, CBF and CBV remain relatively unchanged and MTT increases slightly. The deconvolution algorithm is able to detect an increase in To, but the estimate of To is not accurate. Delay correction is especially critical when intracranial or extracranial causes of circulatory derangement are present. A recent study identified a very small percentage of cases in which the final infarct size following thrombolysis appeared smaller than that predicted by the admission core CBV lesion size calculated by using older generation delay-sensitive software.35 Perfusion maps were recalculated by using a newer commercially available delay-insensitive algorithm. Only 2 of the initial 11 reversible CBV lesions were found to be truly reversible when recalculated by using the newest delay-insensitive software, suggesting that true reversibility of the CBV infarct core is exceedingly rare. Of note, the delay-sensitive software calculated CBV from MTT and CBF according to the central volume principle (CBV = MTT × CBF); both MTT and CBF were, in turn, derived by using a deconvolution algorithm without any of the delay-correction strategies discussed above. Hence, most cases of apparent CT-CBV reversibility, which is rare, are actually pseudoreversible and may be attributed to technical issues associated with lack of delay correction in CTP map postprocessing. Implications of Laterality of AIF Choice. No general consensus has been reached as to whether the AIF should be chosen ipsi- or contralateral to the affected hemisphere, and to date, to our knowledge, few studies have addressed this controversy, though the use of standardized delay-corrected postprocessing software in the future should render this point moot. 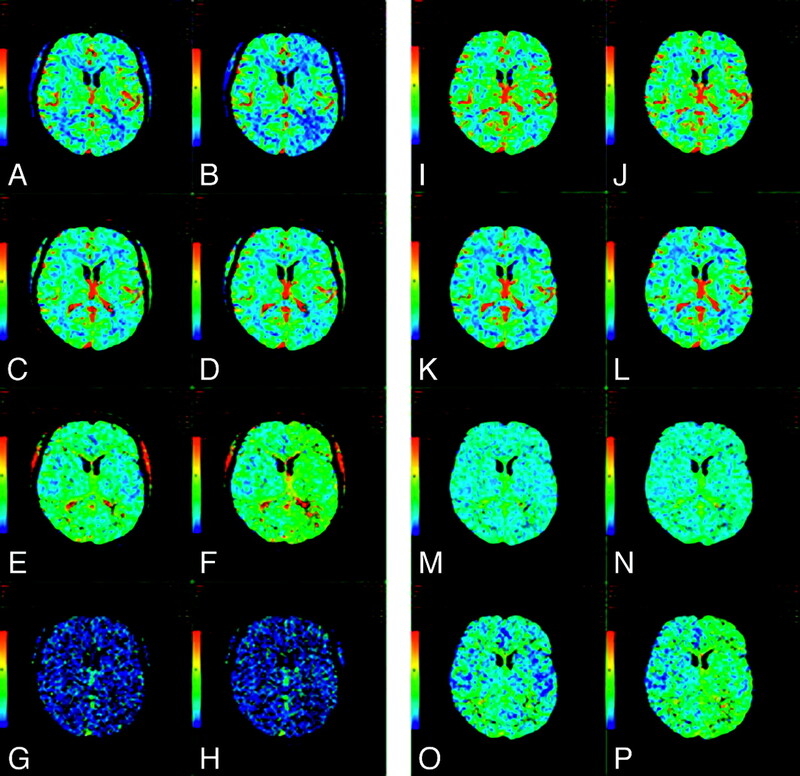 Some have argued that the assumptions underlying most perfusion models are best met by choosing 2 AIFs—a left-sided one for the left hemisphere and a right-sided one for the right hemisphere. Sanelli et al (2004)23 constructed CTP maps at the infarct core of 3 patients and reported that CBF, CBV, and MTT values were independent of the location and size of regions of interest selected for the AIF. Choosing a large proximal intracranial artery versus a smaller distal artery ipsilateral or contralateral to the infarct did not affect the resulting quantitative perfusion values. A more recent study of 18 patients with acute stroke has also reported that infarct core and penumbral CBV and CBF values were significantly correlated between ipsi- and contralateral AIF selection.36 The correlations between infarct core MTT values obtained with different AIFs were lower than those obtained for CBF and CBV, though not significantly; there was no significant correlation of the MTT values in the penumbra. Of note, in both studies above, AIF with substantial delays due to severe stenosis or atrial fibrillation were not specifically studied. Unpublished data from CTP maps of 14 patients with acute stroke at our institution, processed with delay-insensitive software, also suggest that the laterality of the AIF region of interest does not significantly influence the CBV, CBF, and MTT values in the infarct core. AIF selection by using delay-corrected deconvolution based on CTP software appears to be less sensitive to laterality compared with the use of standard available MRP software, which typically is not delay-corrected.37 The inherent difficulties of choosing an optimal AIF from gradient-echo MR imaging source images may also add to the imprecision in reliably measuring perfusion parameters with MRP.29,38 Moreover, because to date, CTP is an “on label” US Food and Drug Administration−approved use of iodinated CT contrast but MRP remains an “off label” indication for gadolinium-based agents, there has understandably been greater interest in developing CTP rather than MRP commercial software packages. Fully Automated Processing of Stroke CTP Maps. The precision of quantitative CTP values is directly linked to the reproducibility of the postprocessing procedure. Most commercially available CTP postprocessing software requires the operator to choose subjectively regions of interest and define parameters that are subsequently applied to the calculations that generate the CBV, CBF, and MTT maps. A recent study reported the variability of CTP data processed by different experienced technologists to be 31%, 30%, and 14% for CBV, CBF, and MTT, respectively.40 The selection of AIF regions of interest, venous function regions of interest, and pre-enhancement intervals (another user-defined parameter describing the baseline of the TDC to be applied before contrast arrival) was very reproducible. The technologists differed significantly with respect to the selection of the postenhancement interval (which is used to define such factors as recirculation). In this respect, fully automated processing of stroke CTP maps, as discussed above, could potentially increase both the precision and accuracy of CBF and CBV determination. An important role of advanced stroke imaging is to provide an assessment of ischemic tissue viability that transcends an arbitrary clock time.41–43 Evidence suggests that the distinction between infarct core and penumbra can be achieved by applying thresholds to the CBF and CBV values.18,44 Ischemic core has a matched decrease in both parameters, whereas the penumbra demonstrates a reduction in CBF with CBV that is maintained, or even elevated, relative to normal contralateral values. The maintained CBV in the penumbra can be attributed to dilation of precapillary arterioles and to engorgement of veins in response to decreased perfusion pressure.45 Matched reduction of CBF and CBV in the ischemic core is thought to be due to the failure of autoregulation with severe hypoperfusion. To define the penumbra and ischemic core, thresholds must be selected for CBF and CBV. With regard to these operationally defined thresholds for core and penumbra, though there is not yet consensus or high-level evidence, current expert opinion favors the use of relative rather than absolute CTP values, given the potential for variability in absolute quantification of CTP map parameters and the dependence of these values on an appropriate but often arbitrary VOF scaling factor. In a pilot study of CTP thresholds for infarction, we found that a <50% reduction of CT-CBF in the penumbra has a high probability of region survival, whereas penumbra with a >66% reduction from baseline values has a high probability of infarction. No region with absolute CBV < 2.2 mL/100 g survived.4,46 The latter is in close agreement with the CBV threshold of 2.0 mL/100 g selected by Wintermark et al to define core.18,47 Because CBV and CBF have different baseline values in gray and white matter, however, (gray matter CBV ∼ 4 mL/100 g/min, white matter CBV ∼ 2 mL/100 g/min; and gray matter CBF ∼ 40–60 mL/100 g/min, white matter CBF ∼ 20–30 mL/100 g/min), it is critical that the contralateral regions of interest used for normalization have the same gray matter/white matter ratio as the ipsilateral ischemic region under study. The Best Possible Perfusion Parameter to Define Salvageable Penumbra? To date, different perfusion parameters with different thresholds have been applied for penumbral assessment in different centers, potentially resulting in different estimates of abnormal perfusion and different patient management decisions. This variability needs to be addressed in definitive trials, with validation of optimal postprocessing and image interpretation procedures, followed by standardization of methodology across different centers. To date, published studies investigating the various perfusion maps have drawn sometimes different conclusions regarding the optimal admission penumbral parameter for predicting outcome. Two MRP studies have reported that TTP is correlated with baseline NIH Stroke Scale (NIHSS) score,56,57 one has suggested a correlation between MTT and the Scandinavian Stroke Scale score,58 2 have reported a correlation between MTT and NIHSS score,59,60 and 3 have reported correlations between MTT and 60- or 90-day follow-up T2 lesions.56,57,61 A recent report by Kane et al (2007)62 addressed this issue by comparing 10 different MRP processing methods in 32 patients with acute ischemic stroke. Different perfusion parameters produced very different estimates of abnormal perfusion in the same data from the same patients, and, therefore, different estimates of penumbral volume. All 5 measures of MTT were associated with baseline NIHSS score and final infarct size; 1 of the MTT measures was fitted arrival time, which was also associated with clinical outcome. Validation of these findings in other datasets is sorely needed so that consensus can be reached regarding which perfusion measures and processing methods should be used routinely. Finally, with regard to display of CTP images, the ASIST group from Japan has advocated replacement of operator-dependent color-scale adjustment with automated color-scale display, to minimize variations in the visual interpretation of perfusion maps. The ability of perfusion imaging to discriminate between ischemic core and penumbra is important in ongoing and future clinical trials. There is currently good level II evidence suggesting that core/penumbra mismatch will be important for patient selection for stroke recanalization therapies extending beyond the current arbitrary cutoffs of 3 hours postictus for intravenous thrombolysis and 6 hours postictus for intra-arterial thrombolysis.63–66 This review has summarized the pearls and pitfalls of CTP theory, acquisition, postprocessing, and image interpretation. Optimal acquisition requires scanning for at least 60–75 seconds and strategies for maximizing z-dimension coverage. The addition of a cardiac MDCT component to assess cardioembolic sources of stroke is an appealing addition to the current integrated neurovascular protocol comprising unenhanced CT, CTA, and CTP. Optimal postprocessing might be achieved with nonparametric deconvolution techniques, such as SVD. Vascular pixel elimination and bolus-tracer delay correction with 1 of the several available methods will likely prove essential for postprocessing optimization, whereas the laterality of AIF selection is unlikely to be an important consideration, with the more widespread application of delay-corrected postprocessing software. Optimal image interpretation requires selection of appropriate CBV and CBF thresholds and choice of the most appropriate perfusion parameter for an operational definition of penumbra. This is a controversial topic; though recent studies have suggested that arrival-time-fitted MTT maps are well correlated with clinical and radiologic outcomes, much work remains to be done so that perfusion imaging is “ready for prime time.”62 Whether relative or absolute CTP thresholds for core and penumbra are optimal and the degree to which this distinction matters also remain an open question. Validation and standardization of CTP methodology will be crucial for the widespread acceptance of advanced imaging in patient selection for novel stroke therapies. Expert consensus regarding standardization of CTP image acquisition has already been reached at the Advanced Neuroimaging for Acute Stroke Treatment meeting held in the fall of 2007 in Washington, DC.2,3 Both this group and the ASIST group in Japan, however, have emphasized the continued need for definitive optimization and validation of commercially available CTP postprocessing software, especially with regard to the necessity for deconvolution methods and delay correction. Once validation is achieved, standardization will minimize interobserver and interhospital variability in selecting patients for novel therapies, including thrombolysis beyond the currently accepted time windows. Level I evidence of improvement in patient outcome by using advanced perfusion imaging is of course the ultimate goal. Standardization of CTP acquisition, postprocessing, and interpretation techniques will likely facilitate future randomized controlled trials that will provide the level I evidence that CTP mismatch is of value in patient selection for the next generation of novel stroke therapies.